My mother, Miriam Josephine (Kidd) Mason, was born on August 23, 1910, so at this writing (May 29, 2010), she is very close to the century mark. She may make it and she may not. It will be a near thing. In my extended family she is the last of the previous generation and has lived to see many changes. She was born in South Africa after the Boer War, lived on the Isle of Jersey in her youth, and at No. 1 Crooked Billet, Wimbledon Common, London. 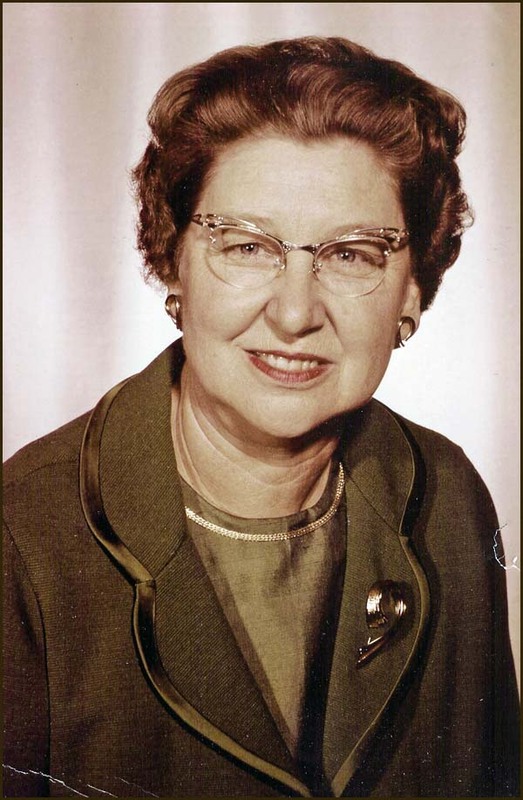 She immigrated to the Calgary area of Canada with her mother and two brothers at eleven years of age. The Canada situation turned out to be not as advertised and after a short stay the family relocated again to Oregon. 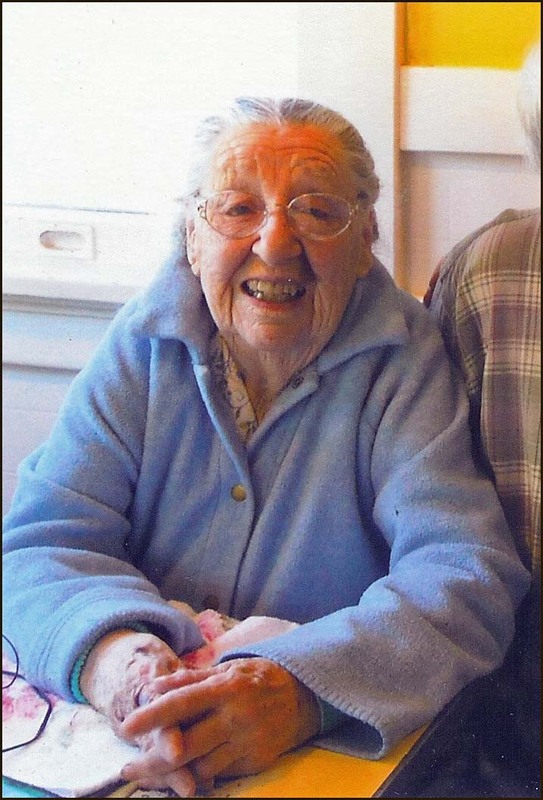 She graduated from Oregon State (College) University in 1934 with a degree in home economics and worked professionally in that field for several years. 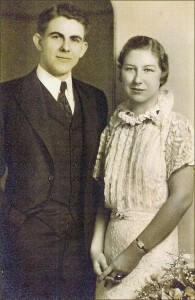 In 1936 she married my father, Donald Lyman Mason (more here ), and gave birth to me in 1938. 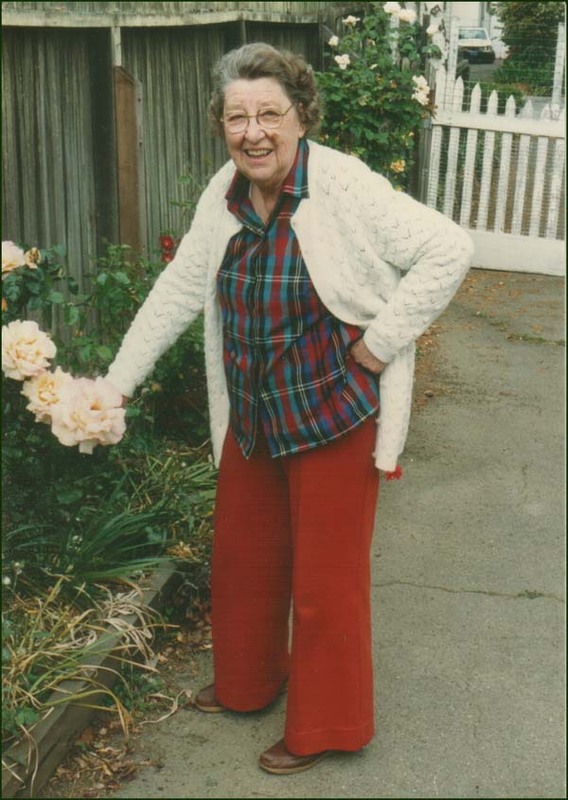 Two years later my sister Irene Joyce (Mason) Jenkins was born and in 1942 the new family moved to Palo Alto, Cailfornia where she still resides in the same house. Mom has no memory of South Africa but she does remember Jersey and I have a few of those memories on tape. Her memory of No. 1 Crooked billet is better, and I remember her telling about looking out the window during WWI and seeing the “Iron Cross” on the bottom of the wings of the German planes and hearing the shrapnel from the antiaircraft guns falling on the roof (more here). The only things I remember Mom saying about the trip to Calgary was that their ship, upon entering the mouth of the St Lawrence River, had to back out again because there was an iceberg lodged there. She also mentioned the trip across Canada on the Canadian Pacific Rail Road. Apparently her mother, Miriam Phoebe (Williams) Kidd, was quite nervous about keeping the family together at various intermediate stops where they detrained to walk about a bit. She didn’t want anybody left behind out there in the middle of nowhere. We also heard a story about attending school in Canada. Mom still had an English accent and the teacher was from the Bronx of New York City. Even though they both were speaking English they couldn’t understand each other. A later school story was about her experience while attending classes in Seaside, Oregon after they had entered the USA. First thing in the morning all the students stood to pledge allegiance to the flag. Jo was somewhat bewildered and decided that since she was a British subject she should not do this thing. When asked why she said, “It’s not my flag and I’m not going to salute it.” That seemed to make sense, but later another student’s mother stopped Jo’s mother on the street saying, “Mrs. Kidd I understand that you won’t let your child pledge allegiance to the flag.” That was the first my grandmother had heard about it. Apparently a genuine foreigner was quite a novelty to insular little Seaside. After graduating from college, Jo was hired by San Joaquin Power and Light with headquarters in Fresno, California. This was in the days of the Rural Electrification Administration, and isolated rural communities and farms were being electrified at a rapid rate. Jo’s job was to go to these outlying areas and demonstrate electrical appliances to those who were unfamiliar with them. It was considered one the best jobs a woman could get in those days. Salesmen from the various electrical appliance manufacturers would chase after her at the end of each day to find out where she had been. Naturally, they would followup in short order. Sometimes they would chase her around personally too and she had some stories to tell about that. I didn’t realize until just recently that she put off becoming a U.S. Citizen until she was 30 years of age. When she did finally get around to it there were some unanticipated complications. She had a hard time proving she was in the country legally. 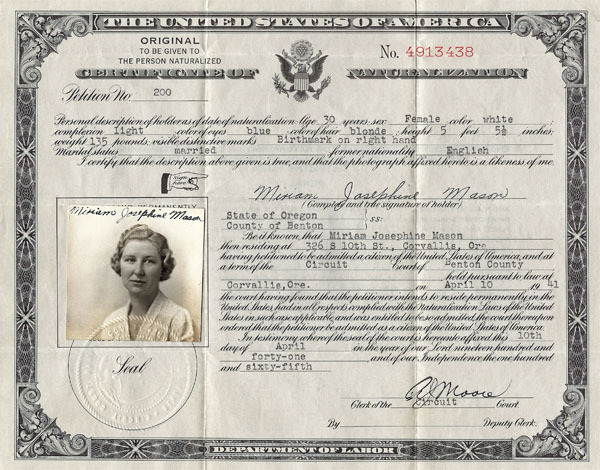 It seems that when she came down from Canada at about age twelve the border officials listed only her mother’s name and then added the phrase “and child.” Proving that she was that “child” turned out to be something of a task.